Through the years, we've seen many, many crane wrecks. From each, we can learn how to avoid future accidents. Below is a collection of crane wrecks. You can click on the photos to the right to see a larger view. Whenever more than one crane is utilized to make a lift it is imperative that established procedures are implemented. Multiple crane lifts are complex and require significant skill and planning. If left to chance the result can be catastrophic. Cranes are equipped with outriggers because they provide the maximum stability required for lifting. However, sometimes it is necessary to pick and carry loads on rubber. If certain precautions are not observed when a mobile crane is in the "on rubber" configuration, the machine will become unstable and topple. Many workers go through the day on a job site and never give a working crane a second thought. Everyone within the radius of a crane must always be alert. A crane can become distressed at any moment and if you're not attentive to your surroundings you are setting yourself up for danger. People with no formal training or prior experience with a mobile crane must not be allowed to engage in its operation. It is too often that an inexperienced operator is used on the job and the end result is injury, property damage or worse. There is no substitute for experience. 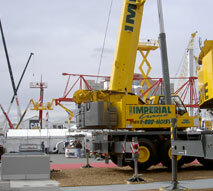 Mobile cranes have four areas of operation: front, sides and rear. Truck mounted cranes, especially those with front bumper counter weights, have much greater lifting capacities when working within the rear quadrant as compared to side quadrant capacities. When an operator fails to recognize the difference during a heavy lift this can be the result. Many of today's high-tech mobile cranes have load monitoring systems. (LMI) if used correctly, these systems can be of a great benefit. However, an operator who abuses the system will eventually learn the consequences as this operator did.